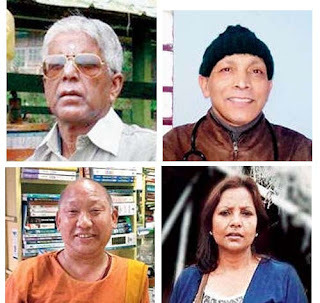 Darjeeling: A professor from Calcutta who has lived in the hills for nearly 50 years, a doctor from Burdwan who has discarded other job offers to serve in the plains, a Buddhist monk who runs a homestay to fund a free boarding school and a social worker who has helped rescue nearly 500 girls from trafficking will be felicitated at the Teesta-Rangeet Tourism Festival on Wednesday. Dipankar Basu, 76: He landed in Darjeeling on September 11, 1968, with the job of a lecturer in political science at Darjeeling Government College, little knowing that he would fall so much in love with the place and people. "In between I got four transfer orders, twice to Presidency College, once to Maulana Azad College and Chandanagore College but I managed to turn down the transfers as I wanted to serve the hill people," said Basu. Basu, who also has a law degree, was made an honorary director of Career Information and Counselling and Coaching Centre by the Darjeeling Gorkha Hill Council since 1991. "I think the students here are smart, friendly and sincere but many lack reading habits. They have to cultivate reading habit so that they can perform even better," said Basu. Anup Kumar Bari, 60: The doctor hails from Badla village in Burdwan district and was posted at the Kuseong sub-divisional hospital in 1995. "From the time I came to Kurseong, I do not feel like serving in any other places. The people here are friendly and it is this love which has kept me here," said Bari. The doctor had offers to move out of the hills and was also given a post of a professor in a medical college but he refuses to leave Kurseong. "As long as I am in service, I will continue to stay here," said Bari, who will retire after five years. Bari is known in Kurseong for going out of his way to help the financially weaker section in the hills. "On holidays, he is always seen holding medical camps in different nook and corners of the hills. Penjo Bhutia, 62: The Buddhist monk was born in Kalimpong and is running a boarding school in the mountains of Sikkim providing free education to underprivileged children irrespective of the caste or religion. "We found out that he had been serving underprivileged children for years now and he himself visits Darjeeling hills to scout for children," said Suraj Sharma, an organiser of the fest. The organisers were dumbfounded when they found out that the simple monk runs a homestay to fund his project. "We found that his main source of funding is the homestay he runs near the school premises at Phadamchen in Sikkim. He provides boarding, food and every other requirement for the children," said Sharma. Bhutia, however, could not be immediately contacted. Rangu Souriya, 43: The woman from Panighatta in the plains of Darjeeling has rescued more than 500 girls from cities like Patna, Delhi, Mumbai and Calcutta and has been working tirelessly to bring about awareness of human trafficking. Souriya was recognised as 100 women across India who are making a difference to their community by the Union ministry of Women and Child Development with the President of India felicitating her at Rastrapati Bhawan in January 2016. "I have just heard about the felicitation programme," said Souriya.